If you remember: when I finished welding my own cargo bike - warmly named Bikeducken - my workshop was a real mess. The build had all kinds of issues, but one of the things that happened is it made me rethink some of the workbench choices/builds I had made in the past. I have to say there is nothing remotely wrong with the Workstand and Deliver I made after I finished making my first mountain bike. But those builds had something in common: they were long projects which made me realize I work in my shop differently than I think I do. The rolling cabinet - which is the core of Workstand and Deliver - is great in that I can move it about the shop. However, when making the Bikeducken, it was in the welding room a lot…even though I wasn't using any of the tools in the cabinet, which only served to take up a lot of space. There's also a big disadvantage to drawers: you can put things in them. I know that's supposed to be a feature rather than a bug, but I found that over the past couple of years I have filled the drawers with so much it's getting harder to find things. Here's what I'm talking about: this is an actual, unedited view of one of the drawers in the rolling cabinet/workstand. Most of the drawers look like this. You may have drawers that look like this too. Just looking at the picture brings me down: you've got a couple of screwdrivers, at least two chain tools, pipe cleaners (occasionally used to get gunk out of chains) and a jumble of other things which include, but is not limited to, a Ned Lamont pencil that dates back to the U.S. Senate race of 2006. So the obvious solution, some might say, would be a tool board. That's fine and good, but I dig mobility. I wanted something that took up a small footprint but had just about every bike-specific tool within arms reach that I could roll anywhere I needed it. 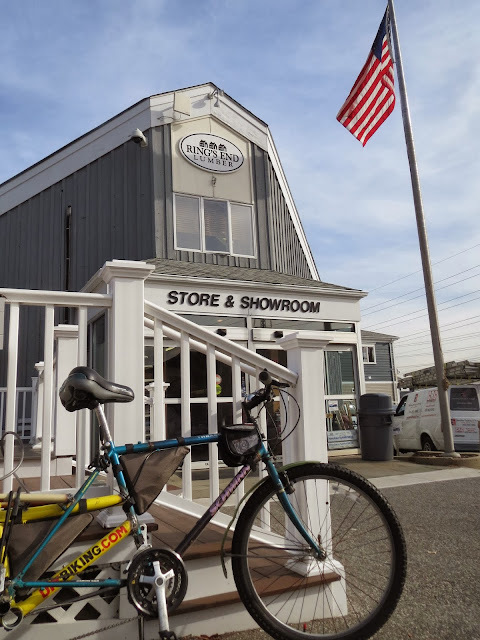 For the lumber I needed for my build, I knew there was only one place to go: Ring's End Lumber in Darien. They had proven themselves invaluable to my wife and I when we were renovating our kitchen (I also bought the new basement door there) and each time I've gotten lumber from them I've been happy with it. I knew what I needed, and I wanted them to cut it: three 16" x 16" pieces, plus two pieces that were both 5'4" long and 16" wide. All of it would come from one sheet of 4' x 8' plywood. And I decided to fetch all of this lumber on the Bikeducken. With the tires fully inflated, the Bikeducken handled the six miles to Ring's End like a champ. Inside, at the customer service desk, a helpful gentleman walked me through the choices of wood (I settled on 3/4" thick birch since it was strong but not too expensive) and was able to quickly print out two pieces of paper - the white sheet and the pink sheet - for me to show to other helpful Ring's End personnel at Building Four. I unlocked the Bikeducken and walked it to Building Four. Inside, I was shown the 4' X 8' sheet of birch. It made a loud noise when they placed it in the saw and I realized I was buying a very heavy piece of wood. Now my plan was to leave the pieces behind that weren't part of the build, but I changed my mind when I realized I had a lot more leftovers than I thought. I elected to take them all, and the Ring's End employee offered to carry everything out of the building. "Is your car out there?" "My vehicle is just outside, yes." I attached the lumber on my own. As I did this, I drew several admiring comments, including a guy who walked up and exclaimed "That is the best work truck I have ever seen!" 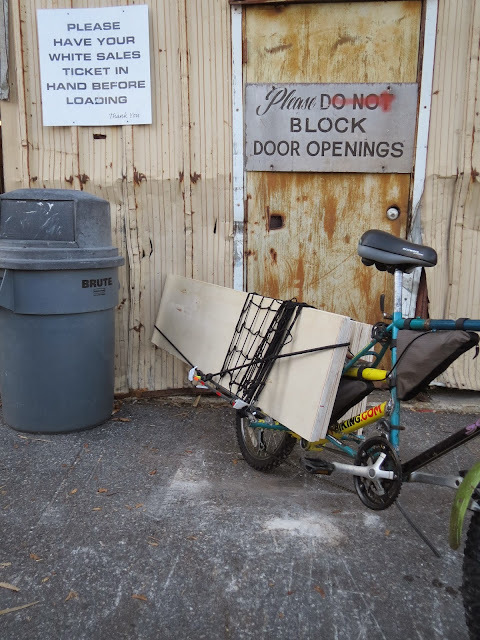 With the lumber, the Bikeducken now stretched more than nine feet long, but soon after I took the photo I pedaled to the entrance, showed the guy in the Checkpoint Charlie booth my little slip of paper, and rode off like I did this every day. Note to anyone who is even remotely considering this: unlike hauling, say, toilet paper, lumber affects handling. In fact, I had no structural trouble with the bike itself since every weld held, but I believe it wanted to pop a wheelie the whole way back. Keeping the speed low, I headed out through downtown Darien which, just like every foot of Rt. 1 in Connecticut, needs bike lanes. I was a little worried that the load would come loose, because if it did, the bike would probably rock violently and throw me off. But as you can see the bungee cords and nets did their job, and I was able to roll safely on Rt. 1 all the way into Stamford. The fastest I got was in the low to mid teens. I stayed in the middle chainring (as a side note: since I couldn't see the rear derailleur I had to guess what gear I was in a lot of the time). The last big climb into the Cove neighborhood of Stamford, I stopped at Pat's Hubba Hubba - an establishment I had never been to before - to buy a milkshake. Not trusting the kickstand at all, I was forced to lean the bike against the building. I sat outside and drank the milkshake with such speed the cup nearly collapsed on itself. As soon as I had disposed of the cup in a trash can, I continued home and made my glorious arrival. Well, I made my arrival. I've carried things on bikes before, but never something that involved three trips and sweating to get it all inside. With the Bikeducken safely locked up (don't laugh: someone actually had the guts and meanness to steal Emily Finch's bike in Portland) I set to work by separating the two 5'4" x 16" pieces aside from the scrap, and getting the three 16" squares together. Then I attached 3" casters to one of the pieces. I had actually wanted bigger, heavier ones but it was important that the cabinet not be too tall; that I could roll it anywhere. I then put the two 5'4" pieces at right angles. The vertical piece in the photo below is actually sitting on two of the scrap pieces that you can't see so neither of the boards overlap. I then attached several angle braces to make everything fit at a right angle. As soon as that was done, I placed two of the black 16" tile squares on the board and marked - with the Ned Lamont pencil - where the edge was. I was basically building it from the top down: 32" of peg board, 3/4" of 16" square work top, 18 1/2" of Snap-On plastic cabinet…followed by one more 3/4" 16" x 16" piece. I wasn't sure what to do with the space left over near the ground at this point. With the marks made and the two long boards mounted stiffly, I set it on the wheeled board, ducked inside, and attached more angle braces. 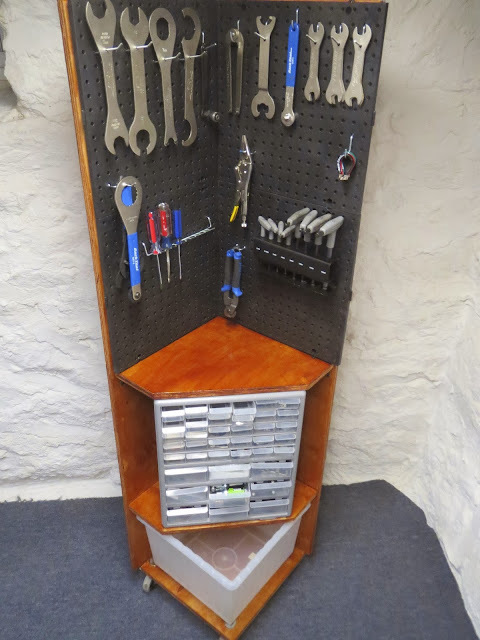 When that was done, I made it even more rigid by adding the bottom shelf where the Snap-On cabinet would go. Making it level was a pain - partly because I probably shouldn't have attached the wheels first but also my basement floor isn't exactly known to be smooth surface. Next, I sawed two of the pieces of 16" x 16" board after marking where the edges of the Snap-On cabinet go. I reasoned that on the work 'space' itself I wouldn't need or want a lot of surface area, but I also wanted to make sure I could see all the little drawers. I used a dull handsaw - and realize just now that I should put better wood saws on my Christmas list. 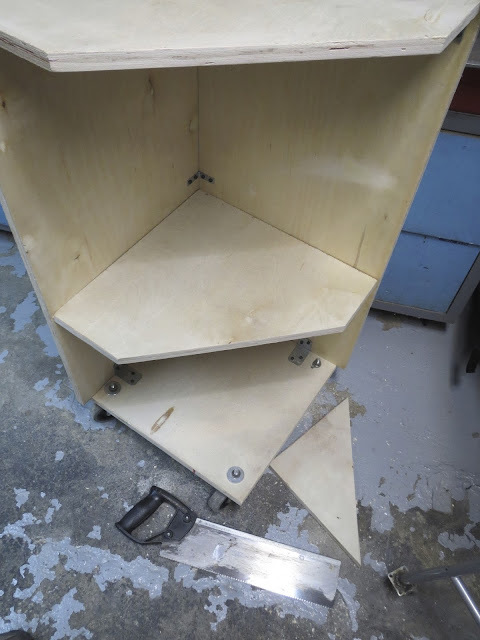 Finished with that bit, I pushed the cabinet over on its back and attached the plastic tool boards. With that done I discovered, by happy chance, a rolling plastic bin from IKEA fit neatly on the bottom shelf. The whole thing rolled as it should but I knew I'd have to bolt or place some heavy objects in the bottom. After I coated it with Polyshades from Minwax, it came out better than I thought. Yes, this was made on my day off from work yesterday; only a few hours after every piece of wood in this photo (plus a few more I didn't use) came home on a cargo bike I built from discarded frames. So I now have a bike tool cabinet that doesn't take up a lot of space, and as long as I position it near where I'm working just about every tool I usually need is within easy reach. 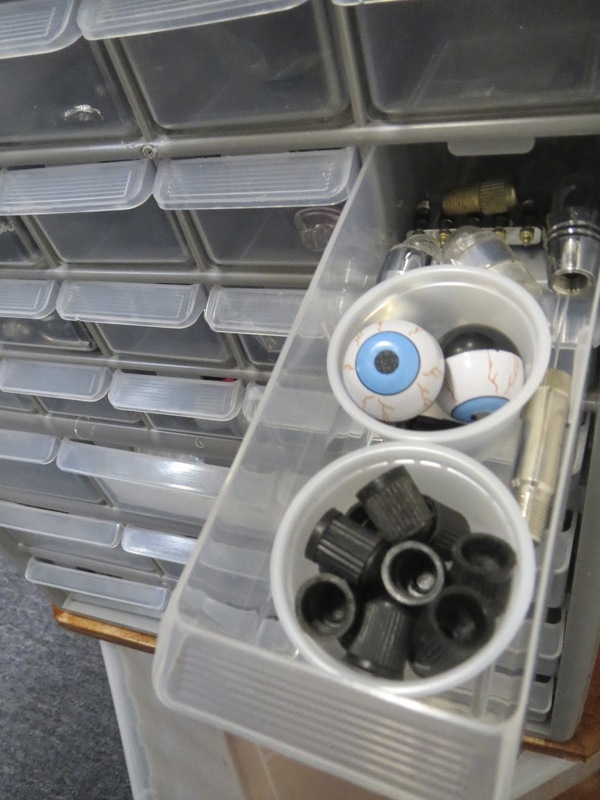 And the Snap-On cabinet is already helping me keep all the little things organized, such as my impressive collection of ordinary and novelty valve caps. I had only been able to locate all of these because yesterday, after I finished the build, I watched 'The Dark Knight' on DVD (and later watched highlights of the San Francisco Batkid on the news) while emptying the cluttered drawers. So, in closing: if you want a rolling cabinet that doesn't take up a lot of space, definitely go to Ring's End and ask for three 16" square pieces and two 5'4" x 16" pieces. Before you know it, your workshop will also be on the road to cleanliness and your cargo bike, if you have one, will be on the road to making history. Thanks for reading and thanks for riding. Thanks for sharing this wonderful long bike hack.